Finding a sleep system that can successfully balance weight, comfort, and durability can be difficult while on a budget. There are many options out there for new or seasoned adventurers, but when camping in moderate temperatures with sturdy trees present, nothing beats sleeping in a hammock. Hammocks can be more comfortable than sleeping in a tent or a bivy. Their designs cradle the body and work well for back sleepers. They are also very effective for lounging during the day; reading a book, taking a nap, or chatting with friends can be easily and comfortably done from a hammock without shutting oneself away from nature. Hammocks are also much lighter and can pack down smaller than tents, making them easy to transport, especially on longer backpacking trips or day hikes. Saving weight on a trip makes the journey much more enjoyable, and the promise of a good sleep in the comfort of a hammock will continue to improve the experience. One such hammock that has proven gratifying on a number of occasions has been the G4Free Mosquito Net Hammock Tent, available from Amazon for under $40. All in all, this hammock is the perfect choice for beginning backpackers, families, and anyone looking to relax for a reasonable price. With a lightweight design, a novel bug net feature, and enough room to comfortably stretch out, this hammock will meet the needs of an average user well. The two causes for concern, an awkward pack size and fragile fabric, are easily mitigated as well. Bug net hoop frames are excellent for keeping mesh fabric away from faces, books, and bodies, but are solid and inflexible, and will require their own space within a pack. With a hammock that has only supple materials, a hammock has much more variability as to where and how it can be stored. As for the potentially tenuous materials of the bug net, shock-loading any hammock can be stressful to its components, including carabiners, ropes and the body of the hammock itself. Even a small person can exhibit a significant amount of stress on a hammock by jumping on it. Taking the necessary precautions to keep your hammock in good condition will do wonders for longevity and keep you safe while you hang. These points should be taken into consideration when searching for any hammock, as these issues can be present with any brand. G4Free has come up with a product suitable for the home or wilderness and has a great track record of accommodating any manufacturer defects that may arise for their customers. With a 100% money-back guarantee to ensure satisfaction with their products, there is no reason not to give the G4Free Mosquito Net Hammock Tent a try. Lightweight: For any hiker or backpacker, keeping pack weight low is essential to being able to travel for miles with less fatigue. The G4Free Mosquito Net Hammock Tent weighs in at just 28 oz, or 1.75 lbs, with the option of shedding additional weight be detaching the bug net frame. As a comparison, the average weight of a one-person tent is approximately 2.5 lbs. While saving one pound of weight may not seem like an incredible benefit, pounds, and even ounces can accumulate and lead to a very heavy pack. Large Dimensions: With a total length of 118 in (approx. 9.8 ft) and a width of 50 in (approx 4 ft), this hammock is comfortable for large and small individuals alike. One can easily fit a sleeping pad and sleeping bag into the hammock for cozy sleeping, or sprawl out to relax in the middle of the day. This product is also rated for a 440lb weight limit, which means an average-sized individual or two small children will be well-supported when hanging. Included Bug Net: Nothing can kill a good camping vibe faster than being swarmed by mosquitoes. Standing water, including lakes, ponds, marshes, and even large puddles can be breeding grounds for many forms of bug life. They are also common destinations for hikers or backpackers, which is why a bug net for a hammock can spell the difference between fun or disaster. The G4Free Mosquito Net Hammock Tent's bug net is not only permanently attached to the hammock itself, but the sheer mesh paneling is held away from the face with a detachable frame, keeping campers from feeling claustrophobic throughout the night or while relaxing during the day. Includes Rigging System: Unlike many other hammock sets, the $32.99 price for the G4Free Mosquito Net Hammock Tent also includes a rigging system, complete with two stainless steel carabiners and nautical grade line for hanging the hammock. Many other brands sell these rigging systems separately, forcing hammock enthusiasts to spend more money and more time waiting for additional supplies. This product gives you all of the pieces to pitch a hammock straight out of the box. 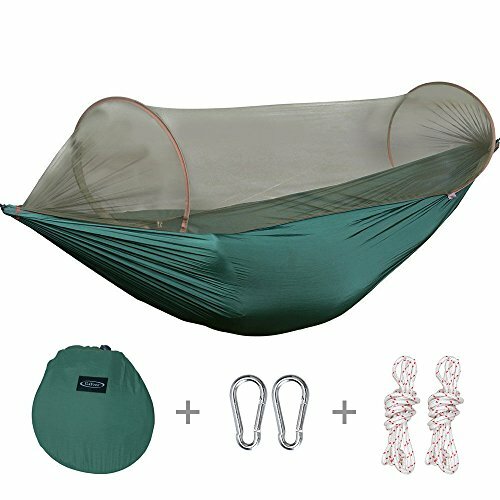 Awkward Packing: This hammock's bug net hoop design is somewhat of a novelty; certainly, many other companies employ the use of ropes or cord to hold the netting away from a camper's face, and completely ignore the use of a bug net "frame". This is perhaps is for a good reason. The downside of any non-flexible material used with a sleep system is its inability to mold to a particular space. As is the case with the bug net hoops, this hammock is awkward to pack and special considerations may need to be taken when packing for a weekend of fun. This shouldn't be a deal breaker, though. The hammock hoops are easy to remove in case of damage or unsuitable pack space and can be left out until the next adventure. Fragile Fabric: This hammock is rated for 440 lbs which, for the average adventurer, should be an adequate rating. Added stresses, however, can be damaging to the fabric. Though these hammocks come with rip-stop nylon, they are not immune to rips themselves. The mesh of the bug net itself is very fragile, and any small tear can allow insects in or can lead to further tearing. This is not isolated to these hammocks, however, but any hammock or mesh fabric used in outdoor gear. TOP QUALITY CAMPING HAMMOCK - Quick drying parachute nylon. Mildew and rot resistant. BEST TRAVELER HAMMOCK - Weighs just 28oz, but with the weight capacity of 440lbs,foldable into a small attached stuff sack (13 x 11.8 inches). Fits in any sized backpack. Ideal for short or long-term traveling, jungle expeditions or hiking, backpacking, backyard, outdoor and indoor. BIG HAMMOCK CAMPING BED - Total hammock length is 118 inches - bed dimensions are 110 inches long and 50 inches wide. Supremely comfortable for 1 large adult with plenty of space to stretch out or move when sleeping. SAY NO TO BUGS - No-see-um Mosquito mesh provides you protection against even the smallest bugs. Other hammocks leave you unprotected. MULTIFUNCTION: ① Used as a normal hammock while putting mosquito net on the bottom; ② Used as a small house by setting up the Mosquito net; ③ Used as a sleeping bag together by putting it on the ground. © 2018 All Around Camping. All rights reserved.